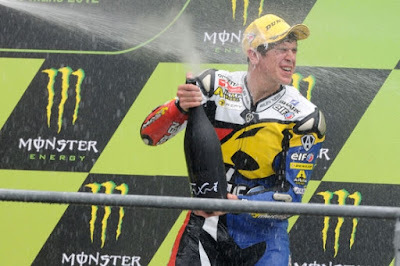 The Marc VDS's Scott Redding is back on podium after his long last podium at Phillip Island 2010. Redding made an impressive weekend on Le Mans circuit. Scott Redding made a very good start from 2nd row, and got his top three until lap 12. Early on lap 13, Redding was down to 4th. Lucky for Redding, Johann Zarco (2nd place) was crashed, and Redding goes 3rd. Redding said, “I am really happy because it feels like a long time since I was on the podium and this is a great result for me and the Marc VDS Team. We have been threatening to get a result like this all season and it feels great because last year was a bit of a disaster and we made a big gamble to change the chassis to Kalex."